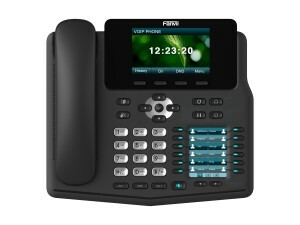 Fanvil X6 – VoIP phone designed for executives and senior managers. IP-phone Fanvil X6 help optimize workflow and intelligently distribute the working hours. Fanvil X6 is compatible with all major modern IP PBX platforms that use the SIP protocol: such as Asterisk, FreeSWITCH, Elastix, 3CX. Phone is equipped with Gigabit Ethernet ports, a connector for a headset RJ9, support PoE. Phone Fanvil X6 supports 6 SIP-accounts. Fanvil X6 – it is the IP-phone designed for a new generation of leaders and senior managers. The main feature of Fanvil X6 is the presence of two displays. Chief among them – a bright, color with a diagonal of 3.4 inches is designed for maximum comfort with the phone and easily perform a large number of functions embedded in the device. The objective of the second display – Displays actions assigned to each of the 12, the DSS keys.